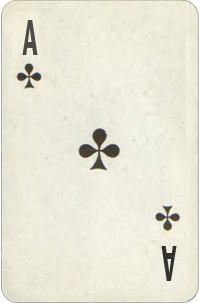 Ace Of Clubs In Venus. Destiny Cards Free Reading. You Are In Your Venus Period! Venus, the goddess of love, represents female relationships and social interactions at every level. It rules our social attitudes and behavior, along with our aesthetic tastes and artistic inclinations. Venus, queen of taste and arts, represents principles of harmony, justice and equilibrium. Our card in Venus shows where our values lie and how we set our priorities. Venus governs our desires. Your card in Venus describes our inclinations with regard to romance, marriage and other partnerships, our capacity for humor and the pursuit of pleasure in all its forms. Ace Of Clubs Basic Meaning: A desire for knowledge. Basic: New idea, plan, a new way of communicating, a new way of thinking. Good time to plan or start something new. Message. Ace suit suggests a strong sense of independence, desire to excel and to lead. It is the most ambitious card and can bring those who identified with it to the greatest heights. "Dream the impossible dream" is the deepest motivation of these people, and the hidden motive is self-acceptance. Ace promotes masculine energy expressed as action and accomplishment. Aces represent Desire. It can be desire to love, knowledge, wealth or wisdom. Aces aren't usually know for their patience, because they have so much to accomplish in this lifetime and so little time to do it and there's no time to stay and look inside themselves, or waiting for others. They may appear selfish at times, but it comes from a compelling urge for freedom and action, and preoccupation to establish their own identity. Each suit represents one of our stages of life. Clubs correspond with our school years, the Summer season, the element Air - the functioning mind of man. Clubs are the guardians of intelligence and rule all mental processes, all psychological reactions, all communications, and messages. They argue, debate, spread the news, investigate, record. Clubs rule all forms of education, legal matters, literature and journalism. If your birthday identifies you as a Club, your prime asset is your mind. People who born as Clubs are interested in ideas and ways of communication. They are looking for truth - in and out. They strive to know facts, details and reasons behind anything happen in life. This vital search for knowledge give them the quality of a "thinker". They are able to counteract their emotions and feeling and solve any issue in an effective and rational manner. Clubs are very active and aggressive especially when they want to express their ideas and thoughts. Their prime weapon in life is their mind, and someone attacking their ideas may become the greatest enemy. You will do well in occupations which provide you with opportunity to share your knowledge, mental power with others - such as teaching, law, writing and counseling. © 2011-2019 Birth Date Compatibility. All Rights Reserved.